With seven games remaining in the 2018-2019 season, the Cleveland Cavaliers currently sit at 19-56, the third-worst record in the NBA. This gives them identical odds at landing a top-four draft pick as the two teams below them in the standings; the New York Knicks and Phoenix Suns. As of now, the lowest Cleveland can pick is seventh, and the Cavs have a 14% shot at landing the first overall pick, and with it, Zion Williamson. However, the Chicago Bulls are right behind the Cavaliers, and appear to be doing everything they can to move up (or drop) in the draft standings. Behind an impressive stretch from rookie Collin Sexton, the Cavs have won three of their past 10 games (baby steps) while the Bulls are just 1.5 games from tying Cleveland. While it would be nice to finish this difficult season with a string of wins and take some momentum into 2019-2020, a few poorly-timed victories could haunt the team for the next decade plus. As /u/TiksonBobikson on Reddit points out, things could get very close between the Cavaliers and Bulls. Chicago appears to be gunning for a bottom-three finish, as basically their entire starting lineup has been and will be out. Lauri Markkanen, Zach LaVine, Otto Porter Jr., and Kris Dunn. For their final six games, the Bulls play Toronto, Washington, and New York and Philadelphia twice each. It’s entirely possible that Chicago goes 1-5 or 2-4 to finish the year. While dropping one spot decreases the chances at landing first overall by “only” 1.5%, it also decreases the odds of getting a top-three pick by 4%, and opens the door to picking at eighth overall. Cavs fans know all too well how a slight difference in odds can make all the difference. Back in 2012 Cleveland won a coin-flip against the New Orleans Hornets, but lost the chance to draft Anthony Davis in the process. The Knicks and Suns have the same odds at a top-four selection as the Cavaliers do right now, and winning a meaningless game or two over these next two weeks and losing equal footing with those teams isn’t worth it. 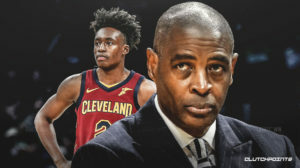 Even if Cleveland isn’t in a position to take Williamson, getting a top-three pick is crucial to their rebuild. One win too many out of these last seven could mean the difference between Ja Morant and R.J. Barrett or Cam Reddish and Brandon Clarke. Reddish and Clarke are fine prospects, but they aren’t on the level of the top three. Collin Sexton has played in every game this season, and should play out the year. Kevin Love and Jordan Clarkson, Cleveland’s leading scorers, should be given a night or two off for “load management”. It doesn’t feel great actively rooting for losses, but that’s what some fans have been doing all season long. Without a playoff berth to play for, the highest draft pick possible should the the goal. The worst thing for a sports team is mediocrity, and thankfully the Cavs were spared that with Love’s early-season injury. It’s unlikely that Cleveland can catch New York or Phoenix, even if they lose all seven remaining games, but staying ahead of Chicago is certainly possible. Getting Barrett would be great. Adding Morant would be fantastic. And if the Cavs are somehow able to land Zion Williamson, the entire outlook of the team changes immediately. But if any of that is going to happen, Cleveland must remain in the bottom three, one step ahead of Chicago.